Counting Escondido homeless on Jan. 29. It happens every year. Interfaith Community Services gets a handle on the extent of homelessness in Escondido with its annual count of homeless people. The count is scheduled for 4 a.m. to 7:30 a.m. Friday, Jan. 29 in the streets and shelters of Escondido. Volunteers are needed, according to agency officials. Called We All Count, the annual single-day event that provides an estimate of the number of homeless persons living in San Diego County. This is important so that Interfaith can can understand the homelessness in the region enabling the agency to provide services helping families, veterans and individuals to leave the streets for a more productive life. It’s also about money as in grants and funding that helps the homeless. Data collected helps Escondido qualify for millions of dollars in funding that is critical to addressing homelessness. Interfaith conducts its count in conjunction with the overall San diego County efforts on behalf of the Regional Continuum of Care Council (RCCC). Interfaith manages the region’s Homeless Management Information System (HMIS), a secure online countywide database that enables service providers to manage those services. HMIS enables regional service groups to collaborate effectively and deliver cost-effective services. Last year’s annual count of San Diego County’s homeless people found 4,156 people living on the streets, a 4.3 percent increase from 2014, and 4,586 in shelters, a 1.4 percent increase. Of those, 430 people were in Escondido, with 112 unsheltered. Also in North County, Oceanside had 420 homeless people, Encinitas had 123 and Carlsbad had 88. 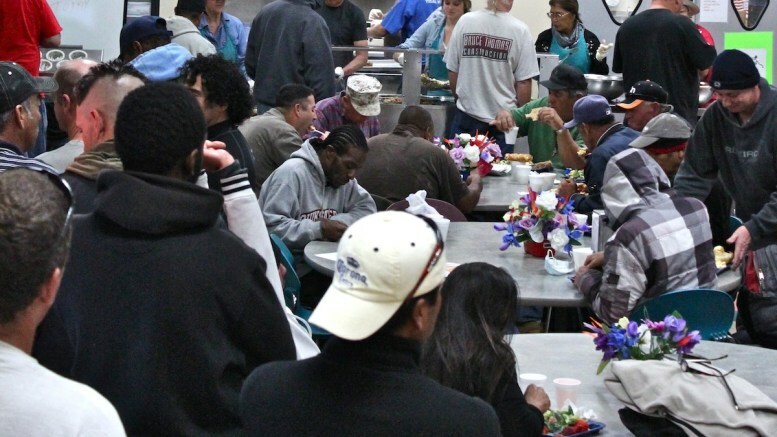 Those who want to help count the homeless should call Holly Nelson at (760) 489-6380, ext. 214 or at hnelson@interfaithservices.org. Volunteers can sign up by visiting http://bit.ly/1OwAdp9. Interfaith community Services serving lunch to the homeless. The Escondido Charitable Foundation wants to give grants to local nonprofits who fight homelessness in the community. The Foundation is putting out a call to action for neighborhoods, nonprofits and community leaders to come up with ways to help solve the problem of homelessness in the community. As such, The Foundation is accepting grant applications for programs that prevent homelessness in the community and help community members pull out of homelessness, including programs that develop life skills and provide housing for Escondido residents and families. Grants will range from $15,000 to $35,000. The deadline to submit an application is 5 p.m. Monday, Feb. 22. For information, visit https://www.sdfoundation.org/grantseekers/apply-for-a-grant/. Be the first to comment on "Counting and aiding Escondido homeless"